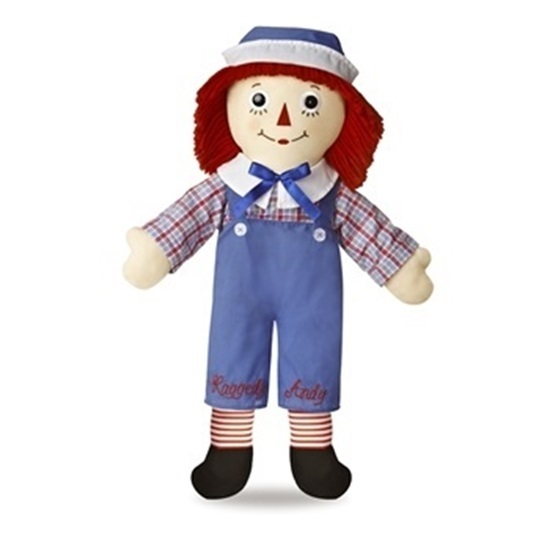 The 16 inch classic Raggedy Andy doll is by Aurora Gift Co. who holds the license. Raggedy Ann and Raggedy Andy dolls are heirloom treasures to be passed along for generations. This is the 25 inch Raggedy Andy doll from the Aurora doll company who now has the license for the Raggedies. Raggedy Andy has the classic looped red yarn hair, stitched facial features, including the classic red triangle nose, plastic button eyes, stitched eyebrows, eyelashes, and mouth. He is wearing the traditional style sailor suit consisting of blue overalls with the words Raggedy Andy stitched in cursive on the legs, a plaid long sleeved shirt with a white collar and blue bow on the front of the collar. Red and white striped legs and black cloth shoes complete this classic, huggable ensemble. A blue and white sailor cap sits atop his head. Raggedy Andy is perfect for ages 2 and up.